Decorative stick pins for bulletin boards, pincushions, plants, crafts, fairy gardens, or just to wear. These will come in assorted blues and teals. Price is for each pin. Select pin length. Decorative stick pins for bulletin boards, pincushions, plants, crafts, fairy gardens, or just to wear. These will come in assorted Earth tones. Price is for each pin. Select pin length. 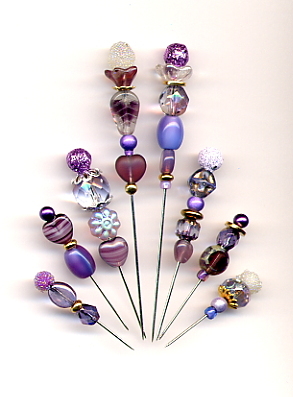 Decorative stick pins for bulletin boards, pincushions, plants, crafts, fairy gardens, or just to wear. These will come in assorted pink colors. Price is for each pin. Select pin length. 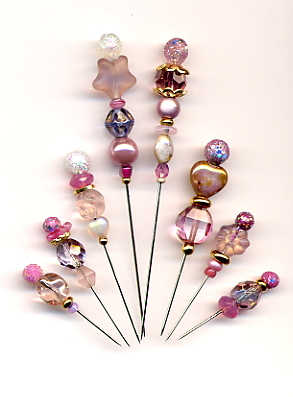 Decorative stick pins for bulletin boards, pincushions, plants, crafts, fairy gardens, or just to wear. These will come in assorted purples and lavender. Price is for each pin. Select pin length. 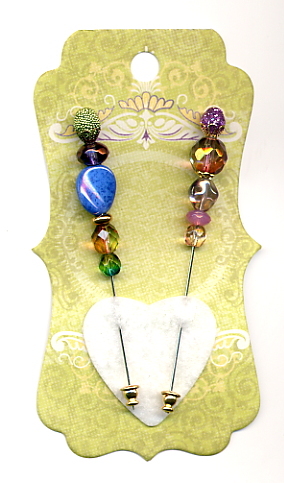 Decorative stick pins for bulletin boards, pincushions, plants, crafts, fairy gardens, or just to wear. These will come in assorted red colors. Price is for each pin. Select pin length. 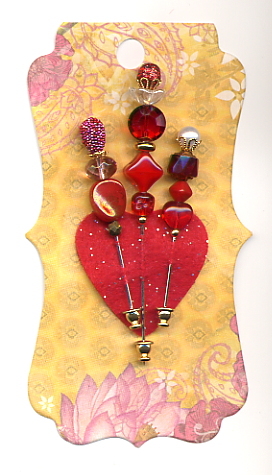 Decorative stick pins for bulletin boards, pincushions, plants, crafts, fairy gardens, or just to wear. Pins are 1 & 1/2" in length. These pins use our hand painted buttons and beads. You can order them on a decorative card or uncarded. Select carding option below. 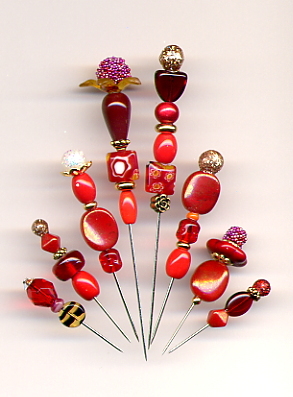 Decorative stick pin for bulletin boards, pincushions, plants, crafts, fairy gardens, or just to wear. 3" in length, this pin uses our hand painted bluebird button. The pin is available carded or uncarded. Select carding option below. 5 available. 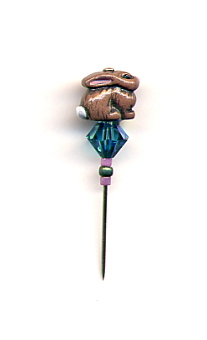 Decorative stick pin for bulletin boards, pincushions, plants, crafts, fairy gardens, or just to wear. 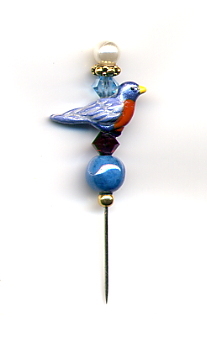 3" in length, this pin uses a hand painted bluebird bead. The pin is available carded or uncarded. Select carding option below. 8 available. Decorative stick pins for bulletin boards, pincushions, plants, crafts, fairy gardens, or just to wear. Pins are 1 & 1/4" in length. These pins use our hand painted buttons and beads. You can order them on a decorative card or uncarded. Select carding option below. 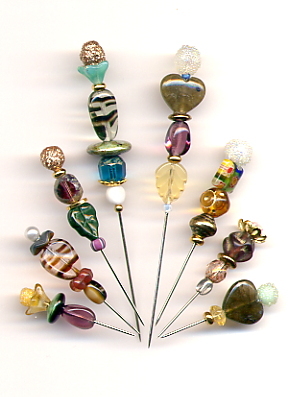 Decorative stick pins for bulletin boards, pincushions, plants, crafts, fairy gardens, or just to wear. 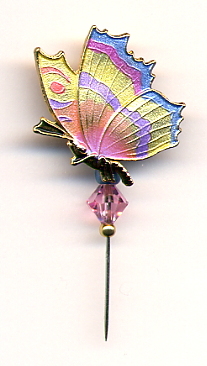 Pins are 1 & 1/2" in length, although the overall length is a little longer because of the butterfly. These pins use our hand painted buttons and beads. You can order them on a decorative card or uncarded. Select carding option below. 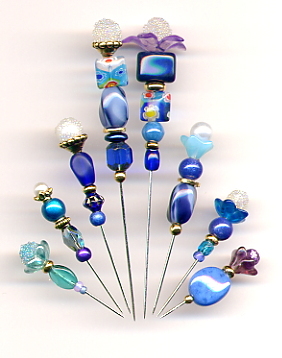 Decorative stick pins for bulletin boards, pincushions, plants, crafts, fairy gardens, etc, or just wear it. The 2 pins are 3" in length. Clutches included. 1 CARD ONLY. 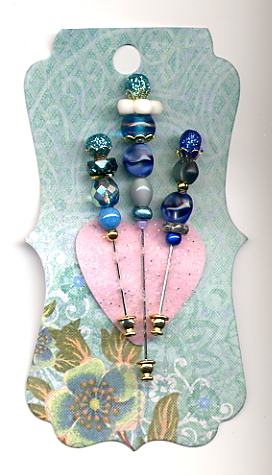 Decorative stick pin for bulletin boards, pincushions, plants, crafts, fairy gardens, or just to wear. 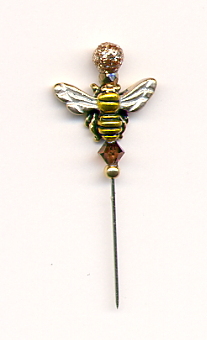 3" in length, this pin uses our hand painted button - Fairy Riding a Bee. The pin is available carded or uncarded. Select carding option below. 1 ONLY. 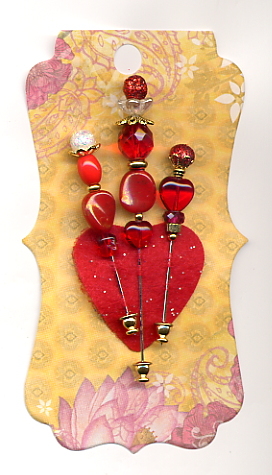 Decorative stick pin for bulletin boards, pincushions, plants, crafts, fairy gardens, or just to wear. 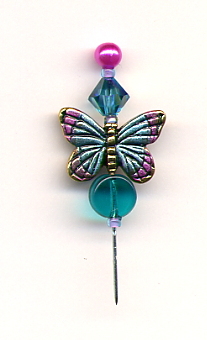 3" in length, this pin uses vintage German glass and other fancy beads. The pin is available carded or uncarded. Select carding option below. 4 available. 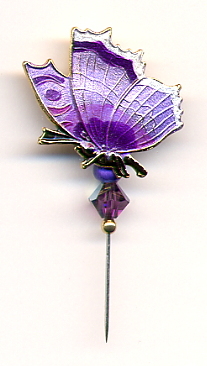 Decorative stick pin for bulletin boards, pincushions, plants, crafts, fairy gardens, or just to wear. 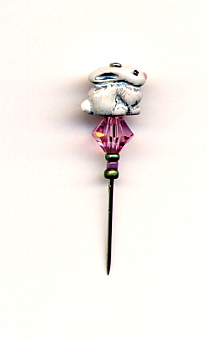 3" in length, this pin uses vintage German glass and other fancy beads. The pin is available carded or uncarded. Select carding option below. 2 available. 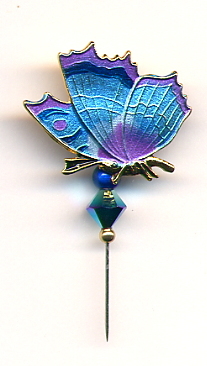 Decorative stick pin for bulletin boards, pincushions, plants, crafts, fairy gardens, or just to wear. 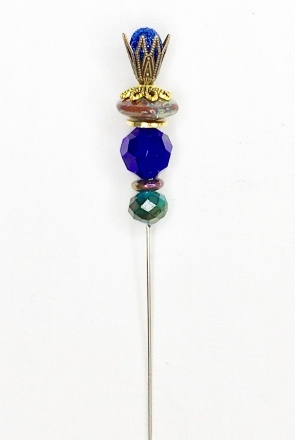 3" in length, this pin uses vintage German glass and other fancy beads. The pin is available carded or uncarded. Select carding option below. 1 ONLY. 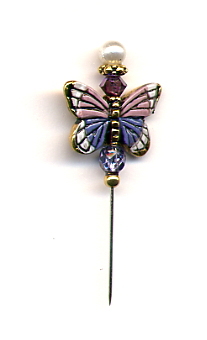 Decorative stick pin for bulletin boards, pincushions, plants, crafts, fairy gardens, or just to wear. 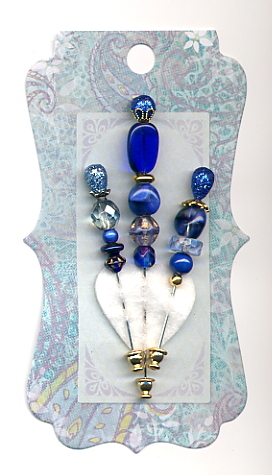 3" in length, this pin uses vintage German glass and other fancy beads. The pin is available carded or uncarded. Select carding option below. 10 available. 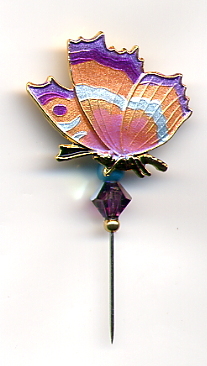 Decorative stick pin for bulletin boards, pincushions, plants, crafts, fairy gardens, or just to wear. 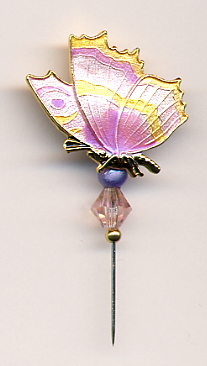 3" in length, this pin uses fancy glass beads.The pin is available carded or uncarded. Select carding option below. 1 ONLY.